Wow, this week really got away from me. I have been one-track focused on moving forward with publishing my book. I'm glad to have finally made a decision on the matter (and I'll blog more on the details soon), but being mired in the logistics of it has left me more than a little fuzzy-headed. It's been a beautiful (hot) week and I've hardly even been outside. This afternoon, I just had to get out. 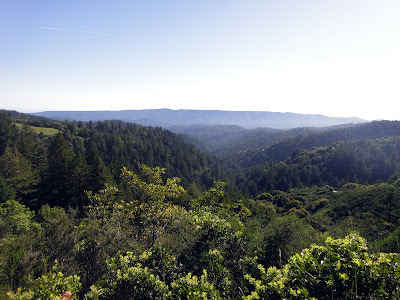 I rode Beat's Calfee up Highway 9 and turned south on Skyline Boulevard, which was new territory for me. I was all business going up Highway 9, but as soon as I turned south, I lost all intensity and focus and just gawked at the scenery and smiled in the sun. I truly am a bike tourist at heart. Luckily, there is a lot of territory up there to explore, both on pavement and dirt roads, as well as fantastically extensive singletrack running routes. 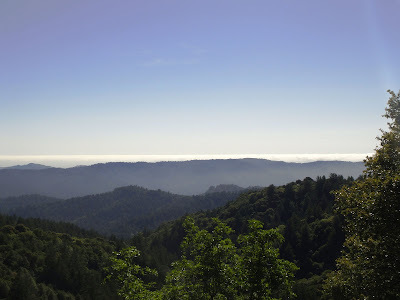 Someday soon I am going to ride a huge road loop that traverses the Santa Cruz Mountains twice. Then I am going link up as much dirt as I can legally piece together with my mountain bike, all the way to the sea. 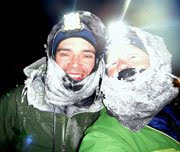 Yeah for bike touring! Skyline does make it hard to keep the focus on training. Lots of open mountain views and a beautiful layer of fog over the Pacific. Smooth, narrow pavement with lots of climbing and almost no cars. More views. I stopped for a little Honey Stinger Chews break at this spot, but had to peel myself away and turn around before I lost too much elevation and really let the ride run long. Ended with 40 miles and 5,000 feet of climbing. Can't wait to double or triple that! You've inspired me to get a real bike so I can explore my local environs. 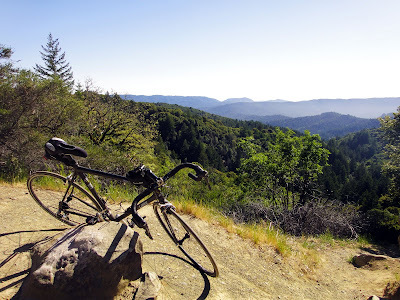 I know absolutely nothing about bikes, so what would you recommend for someone who would primarily be doing paved bike trails and gravel roads (forest roads)? "Smooth, narrow pavement with lots of climbing and almost no cars." 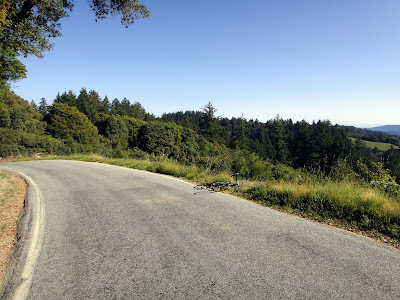 The beauty of riding bay area roads on a weekday. Quite different on a weekend (cars and motorcycles) but very beautiful none the less. Ingunn, did you get an answer to your "what bike" question? Any bike will work on paved bike trails, and any bike that allows say 32mm/1.5" tires will work on gravel roads. But, just to be specific, think about the Surly Long Haul Trucker (LHT) or get something like it. It comes in a wide range of frame sizes, made of comfortable steel, relaxed geometry, has rack/fender braze-ons, big gear range, and the complete has decent components. But, other makers have similar bikes (Soma, Trek, etc). In fact, you can likely find an 80s steel mtb on craigslist for cheap. Trek 820/830, Stumpjumper, etc. etc. Any of these bikes will let you bike to the trailhead, and (non-technical) singletrack. The LHT is kind of a tank, but if you want something something a bit livelier, look at a steel cyclocross bike. These will still run on gravel roads. Surly also has one, the CrossCheck, but there are many others. But, I think you should first consider a true touring bike like the LHT. They are kind of the basic, do-anything bikes (also great commuters). Judging from your blog, you're living in a great place to tour. As for connecting dirt trails, this website is an inspiration: http://mtbtourdepeninsula.org/ and I also have a "mental" map for riding trails between Belmont and Point Reyes via Fifield-Cahill Ridge, Pacifica, SF, Marin Headlands, Mt. Tam, Bolinas Ridge to Olema and perhaps Inverness since there is a Czech pub there. I hope one of these rides will happen this year.